Dental implants are the optimum solution to replace missing teeth, but they can be expensive. If your budget is a concern, you may be interested in mini implants. The placement of mini implants is much simpler than the placement of standard implants. This is mainly because their diameter is significantly smaller, approximately one-third the size of a standard implant. You can see this size difference in the image to the left. Since the fixture is smaller, the surgery is less invasive and the healing time is reduced. All of these factors contribute to mini implants being much less expensive, about half of the price of standard implants. Even though this more economical choice sounds appealing, it is important to consider the pros and cons involved. It has been mentioned that the surgery is simpler due to the fact that there is no surgical flap required. This means there will be less swelling and an overall shorter healing time. There will also be less of a risk for impinging upon other anatomical structures. Facial collapse is still prevented. Mini implants are less expensive. They can be used to help stabilize a denture to minimize slippage and discomfort. Due to the smaller diameter, they are not as strong as standard dental implants. For example, they are not strong enough for use with a dental bridge or single tooth replacement. While mini implants will definitely stabilize a denture, they won’t give you the solid sense of stability that standard implants will. What is far more important than going into your dentist with a certain treatment plan in mind is to solicit the advice of an experienced implant dentist whom you feel you can trust. Remember, implant dentistry is not a regulated specialty within dentistry. So even though it requires extensive additional training beyond dental school to properly place dental implants, this training is not legally required. When inexperienced implant dentists cut corners or compromise on quality, mini implants have been known to become loose or even fall out over time. 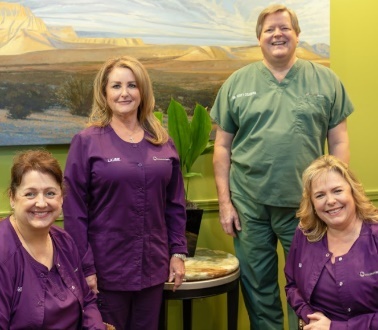 Dr. Coleman, however, has been placing and restoring dental implants for over 30 years, and has passed the examinations to become a Fellow of the International Congress of Oral Implantologists. He will be upfront with you about the limitations you can expect, yet will help you determine the right treatment plan for your personalized needs and budget. Contact us at 713-783-2800 to learn more about your tooth replacement options and find out if these more affordable implants are right for you.